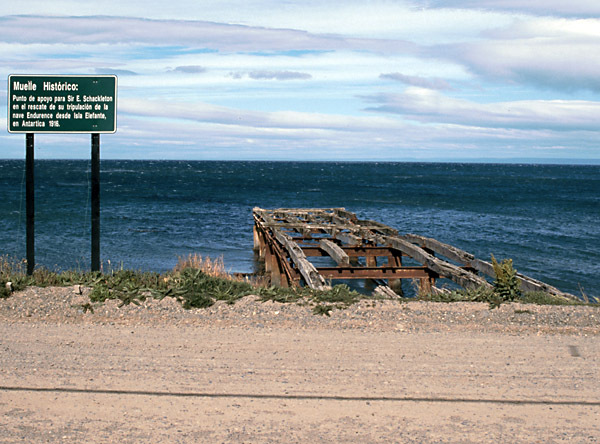 Rio Seco, just four miles up the coast from Punta Arenas, was the site of the first big frigorifico in Magallanes. The plant was constructed on the narrow strip of low ground between the sea and the hills behind, and a muelle was built out directly in front. As a photo below shows (1), the South American Export Syndicate Ltda. was the owner. 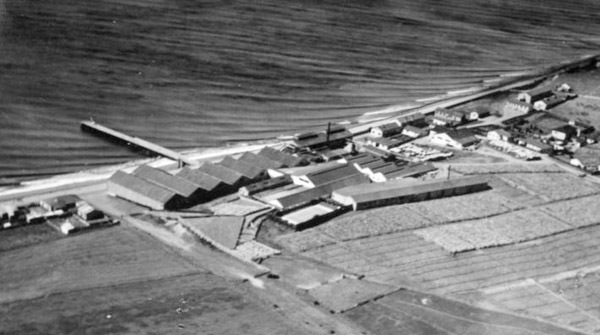 An aerial view from 1935 shows the general layout, but does not give a clear picture of how the ground rises sharply inland from the plant. The muelle is shown with a double line of railway track and a crossover to permit empty wagons to be removed. This layout was common on most similar jetties. Eventually the owners sold out to the COFRIMA group, and whilst part of the plant remains as warehouses for COFRIMA supermarkets, there is no longer a slaughterhouse on the site. In the modern photo below, the buildings remaining are those at either end of the photo above, whilst the central sheds have gone. The view in the opposite direction - looking north with the muelle in the distance. Like other large frigorificos rail wagons were used to move carcases around the buildings and out to the ships at the muelle. However, the cramped nature of the site and the closeness to the shore suggest that locomotives would not have been necessary. In the photo below, looking in through the main gates, a double line of metre gauge track can still be seen heading for the muelle behind the camera. The muelle has largely disappeared, but the remaining stub (left) is a monument, famous principally as Sir Ernest Shackleton's eventual landing place after his epic open boat journey to South Georgia. 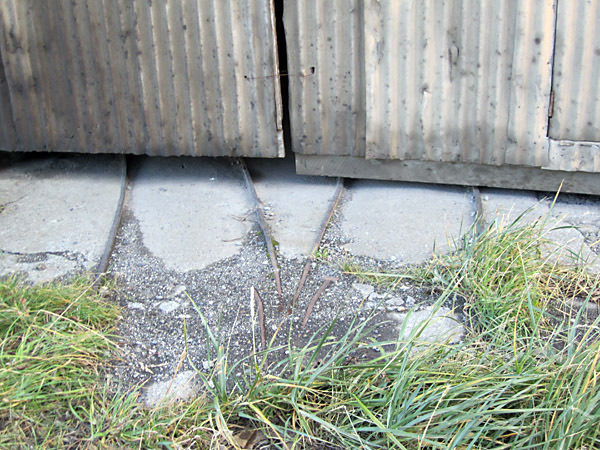 At the main gates of the frigorifico protective barriers are built from old rail (above) - of a most unusual cross-section. 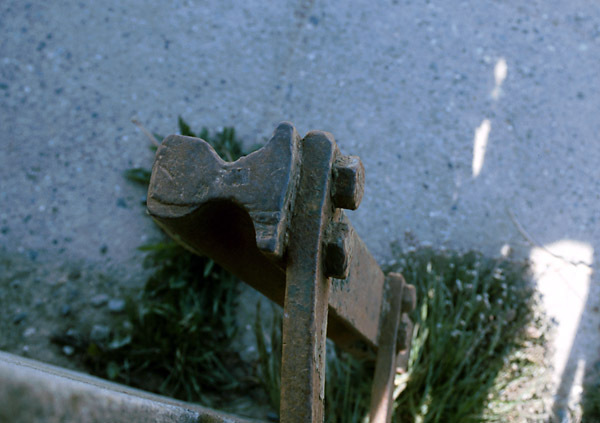 A close look at these samples suggested that they were of wrought iron rather than steel. This would have been unlikely in 1905 so it is possible that the rails were older and had been brought from some other line. As in Ultima Esperanza, the success of one frigorifico inspired the building of others and the Punta Arenas plant opened in 1916. 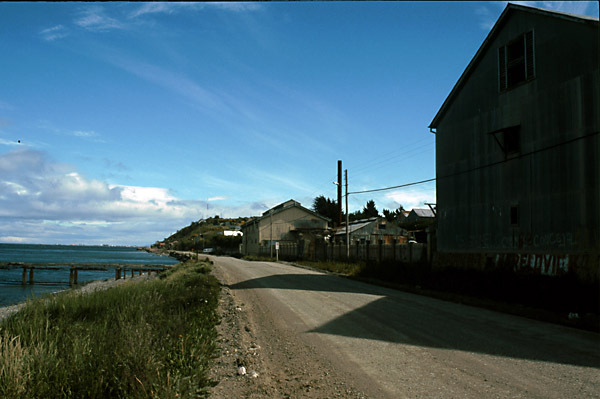 There is considerable confusion between these locations in the town of Punta Arenas, and it may be that some of the information and photographs below are attributed to the wrong sites. Further information would be much appreciated. 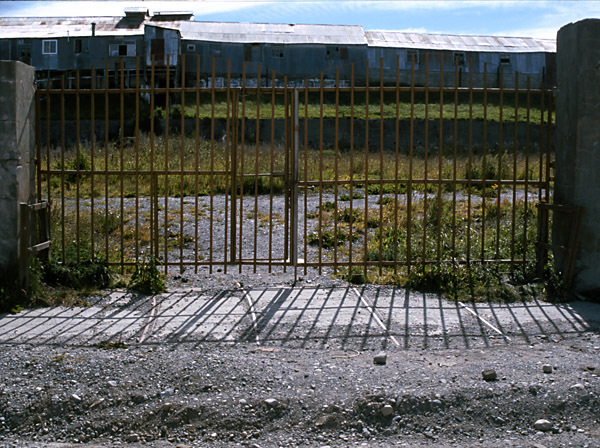 The Punta Arenas site was operated by the Cia. Frigorífica de Punta Arenas and lasted only until the 1940s. There is some dispute over whether this was founded by Juan Hoeneisen (2), or whether he was involved with the Tres Puentes location (3) which may have continued into the 1970s or later Neither of these sites have been fully explored, and the full extent of railway operations is uncertain. The photos below were taken around 1920 (4) in the Punta Arenas factory and only show the earliest of the buildings. Many more were built later. Another 1920 photo, below, shows a line of covered vans on what might again be metre gauge track. Mateo Martinic's 2005 paper on the railways of southern Chile, describes the Hoeneisen frigorifico under the Punta Arenas name (5). He states that this was part of large industrial complex containing several factories and a sawmill. He locates these plants adjacent to the main works of the Mina Loreto railway up the hill on the north-west edge of Punta Arenas in the district now known as Barrio Prat. The railway network within the complex apparently totalled about one and a half kilometres, joining the Mina Loreto line by a curve which is followed by the modern Calle Sargento Aldea. It seems to have continued in operation perhaps until the 1930s,despite the original frigorifico having a less than settled existence after 1923. 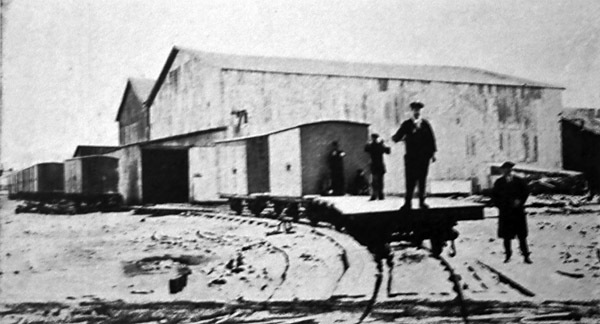 Martinic suggests that the line had its own 0-4-0T loco, but that this was eventually replaced by the occasional use of one of the Mina Loreto railway's two smaller Baldwin 0-4-2Ts. No further details or photos have so far been found. 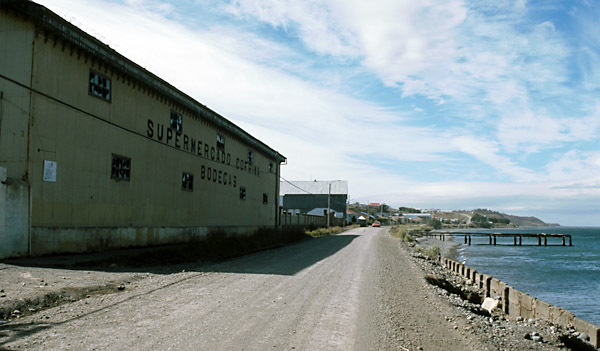 The Tres Puentes plant was just west along the shore from the ferry terminal and shipyard, on the northern outskirts of Punta Arenas. This was the third such facility to be constructed in the Punta Arenas area, and opened in 1923. The buildings still exist and can clearly be seen from the main dual-carriageway heading out towards Rio Seco. A 60cm gauge handworked line was still operating there in 1978 (6), and some minor remains were still to be seen in 2011. 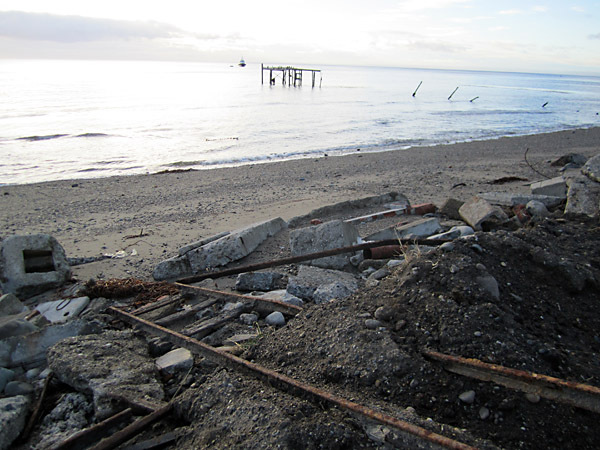 60cm gauge tracks (above) come out of a building to join at a set of points, whilst below a derelict length of track has been tipped onto the beach with the remains of the frigorifico's muelle in the background. 1 Details from Duncan Campbell's website on The British Presence in Southern Patagonia. 2 Ferrocarriles en el Zona austral de Chile 1869-1973. Mateo Martinic, 2005. Instituto de Historia, Pontifica Universidad de Chile, Santiago. Available on the web. 3 Duncan Campbell's site, ibid. 4 Photograph album Punta Arenas y Magallanes. 1920. Carlos Forresti, Punta Arenas. 5 Mateo Martinic, 2005. Ibid. 6 The Railways of Chile, Volume 5 - Southern Chile. 2002. Wilfred Simms. Page 68.